Keep here to see our latest rescues! IN THE PICTURE: She is farthest to the front, and Pickles is off to the right. IN MEMORY: The 7 other chicks rescued with Gloria, a hen pictured later on below. They passed away due to a range of complications from their birth and early raising in the factory farm. 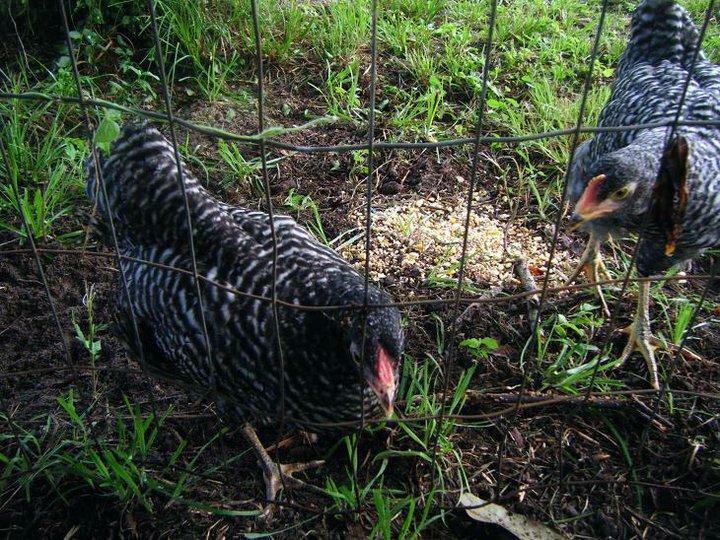 HENNY PENNY- Attacked severely by a dog in June 2011 and brought home on July 4th. PICKLES- Rescued due to being "unwanted"
GLORIA- This sweet hen has far outlived the average factory farm broiler, brought to us over FOUR amazing years ago. BISCUIT- Illegally within city limits due to the fact he was not in an enclosure and running nearly feral, he was adopted. While still very unsocial, he has become a part of our rescue family.